McLaren-Honda are not worried about the pace of their new car after a troubled first test, saying their engine had not been at full power. McLaren ended four days in Jerez this week nearly seven seconds off the pace and with the least mileage of any team after a series of reliability problems. But engineering director Matt Morris said: "We are not running at maximum performance at the moment. "It would be nice to be further up but we have great simulation tools." Morris added: "We know where we are in terms of performance." Morris did not specify where he thought the McLaren would be relative to their rivals if the engine was turned up to full power. But he said the team were still confident they could achieve their target of starting the new season at the level they finished the last - when McLaren were competing for places just off the podium. 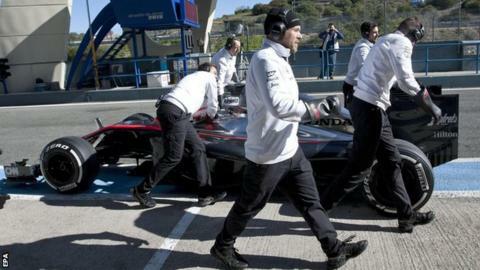 Jenson Button, who drove on the last day of the test in Spain, said the team had made "progress but there is still a long way to go". Morris added: "We've got to get on top of the issues we've got. But if we do get on top of those issues, there is no reason why we can't be performing at least where we were at the end of last year." Morris said the problems that had restricted Fernando Alonso and Button to just 79 laps over four days were a combination of "operational issues" caused because McLaren and Honda had just started their relationship and "some minor electrical issues, which have resulted in a lot of down time but have been relatively easy to fix". There was also a fuel pump failure that ended Button's running on the final day. Asked how McLaren's new driver Alonso had responded to the test, Morris said: "Fernando has been absolutely itching to get in the car for the last few months and it has been a frustrating few days for him but he's happy. "I think he's going to push us on as a team. His motivation levels when he is in the garage, in the simulator, are massively high and that knocks on to everyone else and pushes everyone else on."